The Izod Center in East Rutherford, N.J., home to innumerable Bruce Springsteen concerts as well as years of Nets and Devils games, is on life support. The New Jersey Sports and Exposition Authority voted 10 to 2 on Thursday to close the 34-year-old arena by the end of the month. The 18,000-seat Izod Center continued to present concerts, circuses and ice skating shows, but the New Jersey Devils left for Newark years ago, and the Nets transferred to Brooklyn in 2012. As a result, officials say the arena was expected to lose $8.5 million this year. The board’s decision, made at the urging of Gov. Chris Christie, upset and surprised local officials and hotel operators who had booked rooms for events at the Izod Center. Jim Kirkos, president of the Meadowlands Regional Chamber of Commerce, complained about the loss of tax revenues from the shutdown and business at nearby hotels. He said World Wrestling Entertainment had booked 800 rooms for an event next August. The state could have asked operators to bid for the rights to operate Izod instead of closing the arena on short notice, he said. But the closing of Izod will be a boon for another arena, the Prudential Center in Newark, the current home of the Devils. 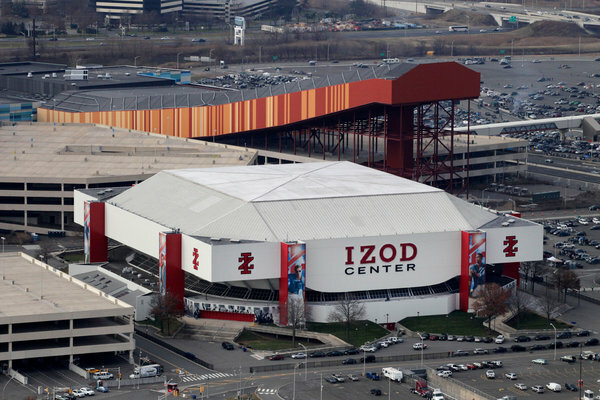 The owners of the Devils have lobbied to shut down Izod since the hockey team moved to Prudential in 2007. The Devils, who control the arena, did not want the competition for bands and other entertainers. But under an agreement struck on Jan. 9 between Prudential Center and the Sports Authority, the Prudential Center agreed to pay the authority $2 million over four years and to try to accommodate any events currently scheduled for Izod. The Devils have had their own financial issues. The team has yet to pay a dime in rent to Newark. That city had invested $220 million in the construction of its $385 million arena. While the team’s long-running legal dispute with the city ended in 2012, the Devils have still not generated enough revenue to pay rent, said Ellen Harris, general counsel of the Newark Housing Authority. The owners of the Devils recently hired Legends Hospitality Management to run the food and beverage operations at the Prudential Center. Critics were quick to draw a connection between the closing of Izod and the contract with Legends, which is owned jointly by the Yankees and Jerry Jones, the owner of the Dallas Cowboys and a friend of Mr. Christie, a Republican. The governor sat with Mr. Jones in the owner’s box for several games during the football season. “There is some suspicion that this is a gift to the Prudential Center and Legends,” said Ms. Weinberg, the Democratic majority leader of the State Senate. Mr. Hasenbalg said the decision was mainly economic. Izod was losing money and bookings were down. The number of concerts, he said, had fallen to eight or 10 a year, from 24 before the Prudential Center opened. The Sports Authority’s problems are not confined to Izod. Critics contend that the Sport Authority lost millions of dollars in revenue after a prior administration signed a sweetheart deal with the Jets and Giants to build a new football stadium. Mr. Hasenbalg said the closing would also allow work to move more swiftly on the adjoining American Dream project, a vast mall combined with a water and amusement park. After years of delays, construction is expected to begin in earnest this year. The Christie administration was in discussions last year with Triple Five, the developer of American Dream, about buying or leasing Izod. But they were unable to come to terms as quickly as the administration wanted. There is the possibility that the arena would be demolished to make way for a hotel. But for the next several years at least, the Izod Center will be dark. Mr. Kirkos and the Chamber of Commerce have drawn up a plan for reinventing the Meadowlands sports complex by linking the arena to a convention center and a possible casino. In the meantime, he said the state should develop a plan to offset the losses in tax revenues by surrounding towns after Izod closes.